20 Absolutely Gorgeous Kurtas For Women To Flaunt At The Next Mehendi Function! Got a mehendi ceremony to attend and confused about what to wear? Well, mehendis are all about dressing up in colourful, vibrant outfits, and kurtas always make for a great option. However, with so many things on the market, it can get difficult to decide which one to pick from! But worry not, for we’ve taken care of the selection for you! Kurtas For Women That Never Fail To Impress! So, if you don’t want to spend much and look fabulous, here are our favourite picks. These 20 kurtas for women in beautiful bright colours surely will stand out! 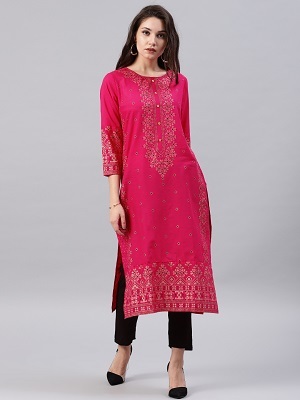 A bright pink kurta with a stylish A line, this is perfect for an afternoon mehendi function. The ethnic motifs done in light gold make this is just so pretty. Pair it with white or black palazzos for a classic look that could possibly never go out of style! An orange and gold straight women’s kurta, this is quite a stunning piece. Golden block prints always look great and this colour combination is one to die for! Wear it with either a pretty flared skirt or palazzos, nothing can go wrong! A nice maathapati and you’re pretty much sorted for the occasion! A bright blue anarkali kurta with short sleeves is perfect for a summer mehendi function. One of the most loved kurtas for women, this one is an absolute classic! The yellow florals look so charming and when paired with solid palazzos, this will look fabulous. Opt for quirky hair accessories, slip into a pretty pair of juttis and you’re all set! Purple is such a fabulous colour and this women’s kurta comes with a bit of gold print work that totally does set it apart. An A-line kurta, this one will look amazing with matching churidars. Pretty gold juttis and a potli bag will complete your mehendi look. 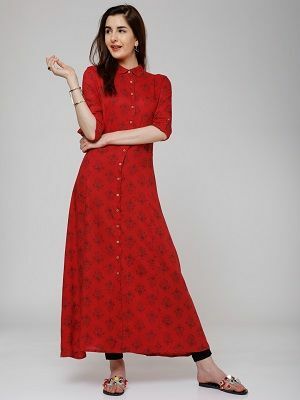 If you love red, this is the only kurta you need to add to your collection. Featuring gold booti print, this ethnic kurta looks totally festive and is a great pick for the bestie’s mehendi. Gold chandbalis, high heels and a nice clutch are all you need. Confused about what to wear for your friend’s day mehendi? Just opt for a kurta with a print in vibrant colours to make you stand out. And this one surely with indigo print does fit the bill. Put on lots of colourful jewellery and get ready to dance the night away. 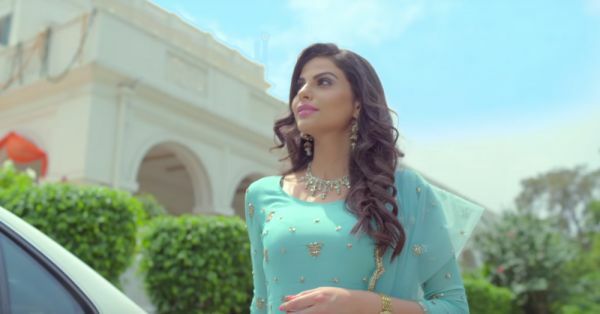 A mint green blue kurta, this is just summer perfect! With bold and intricate patterns, the colour truly is refreshing. Wear it with off-white pants or palazzos and opt for gorgeous colourful jewellery to make yours a winning look. A bright pink lip colour and you’re sorted. A blue printed kurta with red lining, we love the stylised look of this one. 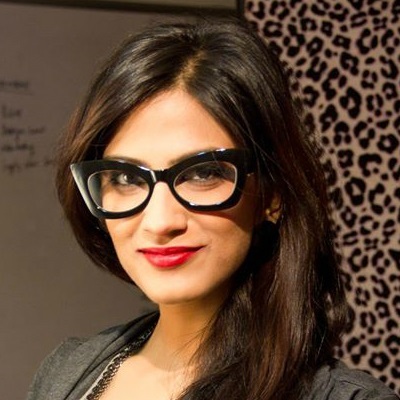 Pair it with white churidars, chaandbalis, and high heels to make an impression. Also, do not forget that bright red lipstick. It’s just what you need for a mehendi function. Have fun, girl! An off-white colour with gold foil work - this one surely does look fabulous. Accentuate your look by pairing the kurta with an embroidered lower and do not forget to carry a potli bag with this. High heels, loose curls, and chandbalis will complete your look. Price: Rs 2,299. Buy it here. An elegant maroon kurta, this is such a classy pick for a friend’s mehendi. The gold detailed work on the neck and sleeves is absolutely stunning, and we love the flared look! You could also opt for a ghagra skirt for a more festive look. Go all out and look fun and fabulous in this stunning combination of green and pink. So pretty, right?! The asymmetrical layered look is totally on point and we bet you’ll be showered with compliments each time you wear this. An elegant and classy blue kurta with an ethnic motif, this is just how you keep it simple yet stylish. Blue looks fab with red and a pair of red palazzos are just what you need to look every bit festive. Gold jhumkas and juttis will complete your look. 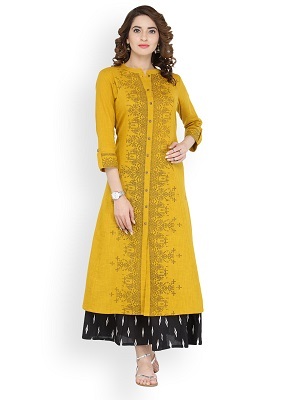 Look elegant in a mustard yellow kurta. It’s subtle and oh-so-pretty, and when paired with a matching palazzo, it surely will look a class apart. Borrow your mom's gold jhumkas and wear lots of delicate bangles to complete your look. Red never fails to look great! Be it day or night, this is one colour that’ll always look spectacular. And there are just so many colour combinations you can try with this. Go all out with the jewellery and do not forgot that deep red lipstick. Price: Rs 2,049. Buy it here. A beautiful coral shade with intricate thread embroidery on the border, this is such a stunning kurti. Corals are all the rage this season and you totally need to wear this for your bestie’s mehendi. Opt for kolhapuri chappals and silk trousers to complete the look. We believe that layering can never go out of style! 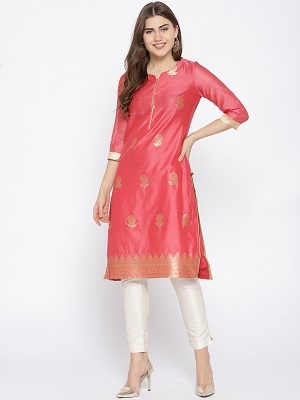 This beautiful beige print and pink-layered A-line kurta has totally got us swooning! Pair it with light coloured palazzos and open sandals for that absolutely perfect mehendi look! Who doesn’t love flowing anarkalis? Perfect for every wedding occasion, anarkalis are effortlessly vibrant and instantly jazz up your look! 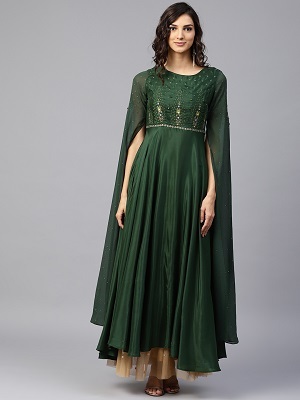 We’re absolutely in love with this midnight blue anarkali with silver-toned flower motifs! Pair it with some silver jewellery and get set to glam! Price: Rs 2,949. Buy it here. We are all for tassels! They are cute, perky, and instantly add quirk to any outfit, which makes them perfect for mehendi! This black kurta with pink tassels will instantly add pop to your look, and will the perfect outfit for your BFF’s wedding! Indigo prints never go out of style, and what’s more, they look good in almost every occasion! We’re in love with this blue and black printed anarkali, and the fitted, sleeveless bodice add just the right amount of charm! Pair it with red leggings to complete the look. Now that you know all the possible kurta designs for female mehendi outfits, what are you waiting for? Let’s start shopping!